To make the world a better place to live by leaving our families, communities, country and world better than we found them. 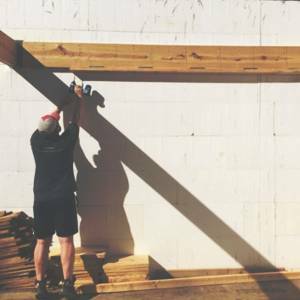 An ECRS employee assists in home construction as a volunteer with the Watauga County Habitat for Humanity. Since its founding 30 years ago, ECRS has strived to harness the power of free enterprise to positively impact lives both locally and globally. Over a decade ago ECRS formalized this goal when we joined forces with Maison Fortune Orphanage Foundation, an organization devoted to the support of the Maison Fortuné Orphanage and Primary School located in Hinche, Haiti. Maison Fortune Orphanage houses approximately 235 children, teaches about 300 students in it’s primary school, and serves more than 700 meals per day. Since 2008, ECRS has donated over a quarter of a million dollars to the foundation. While maintaining our efforts with the Maison Fortune Orphanage, we have also taken part in various opportunities to reach youth on a local level. From donating the company parking lot for fundraising on ASU football game days, to leading scout troops after school, to helping out at local sports competitions, ECRS employees have donated hundreds of hours to supporting the youth of Watauga County. With the start of our 30th year in business, ECRS has decided to turn it’s focus even more local through the new ECRS Community Grant Program. In 2019, ECRS will be focusing it’s grants on projects that provide a major, positive impact on the lives of local children and/or young adults, especially underserved populations. We’re very excited to unveil this new community program. Our hope is that recipients can take this larger grant and accomplish something really impactful from it. ECRS will offer an open-entry application period to local organizations to receive a community grant. There will be three grants awarded to three recipients. Applications for all three grants are being accepted from January 15, 2019 to March 15, 2019. Notification to recipient winners will be made by April 15, 2019. Funds will be distributed to recipients during the appropriate quarter they were awarded for (Spring, Summer or Fall). Complete criteria details for applicants can be found here.